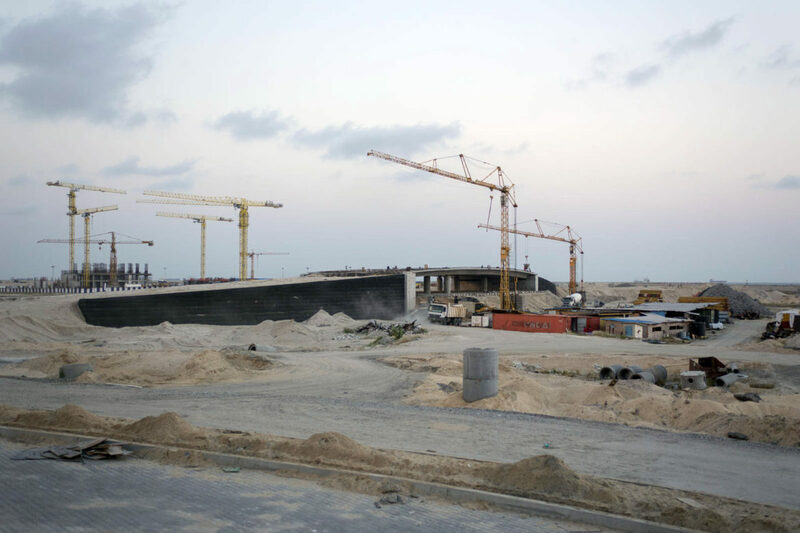 Lagos, Nigeria; January 17, 2017: Eko Atlantic City, one of the world’s most advanced new cities being built adjacent to Victoria Island in Lagos, Nigeria has made significant progress in its infrastructural development ( for phase one & two ) . One of the city’s achievements is the completion of 14 bridge structures in just two years. The bridges, built to international standards, within phase one and two, which extends to over five million square metres representing half of the entire planned city development. 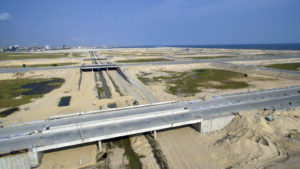 3 completed bridges: Avenue 1 bridge, in the foreground, was the first to be completed in Eko Atlantic – it has a total of 6 lanes. Second in line, the Eko Boulevard bridge, is the widest in the city, with a total of 8 lanes. The last in line is Avenue 3 bridge, with 6 lanes in total. Work on the bridge project commenced in December 2014 when the first bridge deck was cast and the last bridge project completed on schedule in December 2016. Phase one & two of the city, which is divided into 8 districts (Harbour Lights, Business Districts, Eko Drive, Marina, Ocean Front, Down town, Eko Energy Estate and Avenues), is planned for mixed-use with commercial, residential, entertainment and leisure activities to make the city a 24/7 lively environment. With the new bridges all the districts are now accessible by road. The bridgeworks have formed a major element of the works and it has also enabled all major avenues to overpass the canal system running through the spine of the project. All the bridges are between 2-8 lanes. For instance, Bridge 7 comprises a six-lane carriageway and is located on Avenue 1, thus defining the western boundary of the Business District, the commercial heartland of the city. Spanning 52 metres overall in three sections, Bridge 7 is typical of the design utilised throughout all bridges and comprises a reinforced concrete cast in-situ deck with concrete piers and abutments. Also post-tensioning techniques were employed on the horizontal deck to achieve the span required. 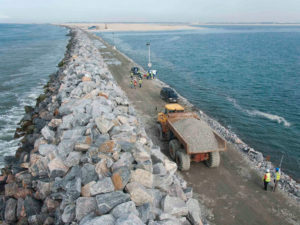 The last bridge was deliberately constructed to overpass the canal entrance to the South West Marina, defining the marine access to the Atlantic Ocean. Mr David Frame, Managing Director of South Energyx Nigeria Limited (SENL), a subsidiary of the Chagoury Group said, “We are fully committed to ensuring that the project is completed on schedule. With the successful completion of all the bridges, all the major avenues within Phase 1 and 2 of the City are now fully interconnected, with the comprehensive road network of the City defined and all zones accessible.” He hinted that the company has a lot of announcements planned for the year as it achieves more key milestones in the project. It would be recalled that the city in November last year unveiled the first of the Eko Pearl Towers, a residential building in its Marina District. The commissioning of the Tower which was done by the Lagos State governor, Akinwunmi Ambode came some months after the commissioning of the city’s Eko Boulevard, Nigeria’s first eight-lane city road.